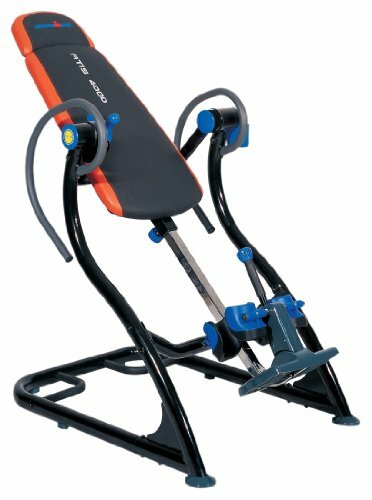 The IronMan ATIS (AB Inversion Training System) 4000 provides the additional benefit of AB training while inverting. At the same time inverting will provide effective back stretching and relaxation. The ATIS will lock at 10 different inverting angles. The ATIS can be locked for mounting and dismounting. It is constructed of extra wide oval tubing for extra weight support. The 2 1/2" foam backrest with 1" of Memory Foam provides extra an extra comfortable backrest with an extended head rest for head support. The ATIS can support up to 320 lbs and up to 6'6" of height. Inverting hand grips (patent pending) provides maximum stretching while inverting. "Smart Gear" (patent pending) locks the table in different inverting positions, one of which is a full 180 degrees. "Ratchet Gear" locks the ankles in place easily and comfortably. "Super Side Holder" can store cell phones, eye glasses, wallets, coins and other articles while inverting. An extra large foot platform provides easy on and off the inversion table.